I have successfullly worked on some projects getting one Site to page one, some to page two and a little below that. It is a lot of work involved including analysis tools and optimization of text content and keywords. Other important aspects are getting links from other sites with similar content as well as links from social networks. The search engines behave slighly different but the basic concept can be applied to them all(almost)). 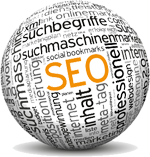 One of the problems is to find out suitable keywords or combination of keywords. Which keywords will the users enter when they search? Also here, some of the analysis tools can be helpful. After having studied a lot literature on this topic, tested some analysis tools and implemented what I had learned on a number of Web sites I put together a little booklet for myself with some of 25 most important activities required in order to get good results by the search eingines. If I can help you with getting good results by the search eingines just let me know!